RCB's campaign went from bad to worse. Royal Challengers Bangalore’s (RCB) poor run of form continued as they tasted their seventh defeat in this edition’s Indian Premier League (IPL). 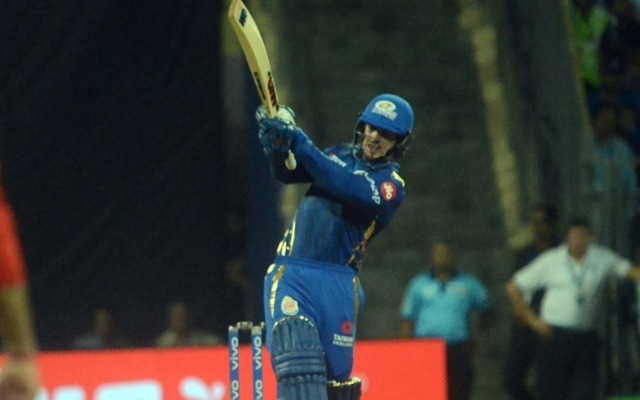 The Red Army lost to the Mumbai Indians (MI) by five wickets at the Wankhede Stadium in Mumbai. Subsequently, they virtually got knocked out from the tournament. In the meantime, MI went to the third position of the table with five wickets. After being put in to bat first, RCB could manage only 171 for seven in 20 overs. Their start wasn’t a great one as Jason Behrendorff found Virat Kohli’s inside-edge to send him packing in the third over. Parthiv Patel didn’t bog down and scored 28 from 20 with four boundaries and a six. Then it was Moeen Ali and AB de Villiers, who steadied the ship with an impressive stand of 95 runs from 61 deliveries. Lasith Malinga separated the duo by dismissing the ominous-looking Moeen, who notched a fifty, in the 18th over. In the same over, Malinga nipped out Marcus Stoinis for a golden duck. At the other end, ABD played until the last over and was run out after getting 75 from 51 balls with six fours and four over-boundaries. Malinga was the wrecker in chief with a four-wicket haul that somewhat restricted the RCB. Mumbai got off to a thunderous start courtesy of a 70-run stand between Quinton de Kock and Rohit Sharma. Nevertheless, Moeen Ali gave RCB a breather as he nipped out both the openers in the same over. Even as Rohit scored 28 from 19, De Kock’s knock was cut short on 40 from 26. Thereafter, the spinners came to the party and put a lid on the scoring. Ishan Kishan hit three sixes to score 21 runs. He perished to Yuzvendra Chahal after trying to deposit the bowler down the ground. Suryakumar Yadav got 29 crucial runs, after which he became Chahal’s second victim. Mohammed Siraj picked up Krunal Pandya. Pawan Negi came to bowl the 19th over with 24 runs needed and Hardik on strike. He bowled a dot, but Pandya laid into him and kept depositing the ball to the MI home with one over to spare. We played a pretty good game I guess. With the ball, we weren’t that great in the first six overs but the guys fought hard in the middle overs and came back well. At the end, we had to take the risk with the left-arm spinner, with two right-handed batsmen. Giving pace was risky, especially with a bit of dew. Unfortunately, it didn’t come off. He’s (Moeen) been outstanding. Striking the ball well and bowling with a lot of heart. It’s good to see a senior player taking responsibility and he deserves all the credit. (On the road ahead) We just have to enjoy ourselves, play the way we did in the last two games. Need to keep our composure under pressure. Need to take half-chances. His (Hardik) hitting has been helping the team and him as well, to move forward. This is something he wanted to do because he didn’t have a lot of time before coming to the IPL. So he wanted to prove a point, to himself than anyone else. Lasith’s performance matters a lot for us. We missed him for a few games. His form is very critical for Mumbai. Trust me, overs the years, bowling at the death at the Wankhede is very difficult. Credit goes to the bowlers for restricting a good RCB batting line-up to 170 odd. To be honest, I still haven’t figured out the pitch here this season. Normally it’s safe to chase here, but today no one expected it to play this way.